Wood engraving from The National Police Gazette. The caption reads, "A wild western amazon. 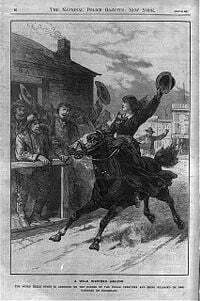 The noted Belle Starr is arrested on the border of Indian Territory and being released on bail vanishes on horseback." Myra Maybelle Shirley Reed Starr, better known as Belle Starr (February 5, 1848 – February 3, 1889), was a famous American female outlaw. She was a well-known figure during the late nineteenth century and is rumored to have been involved with a number of famous criminals during her day, including Cole Younger and Jesse James. As her life passed from reality into fiction, she was depicted as something of a tragic figure, as a young girl who just happened to be a crack shot, who, as time progressed, was forced to become an outlaw due to misunderstandings and circumstances beyond her control. The process by which outlaws such as the James brothers, Billy the Kid and Starr among others, acquired iconic status in a country that claims law and order as its very basis, may nonetheless reflect the suspicion that the law does not always favor the poor or disadvantaged, so the actions of some who set themselves over and against the law and those who make and enforce it, who are usually rich, has an aura of romance. She was born Myra Maybelle Shirley (known as May to her family) on her father's farm near Carthage, Missouri. Her father was John Shirley. He married Nancy Fowler in 1818 and had two children before divorcing her and remarrying in 1829 only to divorce again. John married once more in the 1830s, this time to Elizabeth (Eliza) Pennington (from the Hatfield side of the feuding Hatfield and McCoy families) and had three more children, including Myra in 1848. He had acquired the farm on which Myra was born after the Sarcoxie War had driven out Missouri's Osage Indians and the Homestead Act freed the territory to settlement. In the 1860s her father sold the 800 acre farm and moved the family to Carthage buying an inn and livery stable on the town square. May Shirley received a classical education and learned piano. She was bright, yet strong-willed. Myra was reared in a family were multiple marriages and half relatives were the norm and this pattern was reflected in her later life. After a Union attack on Carthage in 1864, the Shirleys moved to Scyene, Texas. According to legend, it was at Scyene that the Shirleys became associated with a number of Missouri-born criminals, including Jesse James and the Youngers. In fact, she knew the Younger brothers and the James boys because she grew up with them in Missouri, and her brother John Alexander Shirley (known as Bud) served with them in Quantrill's Raiders, alongside a neighbor boy, James C. Reed. Her brother served as one of Quantrill's Scouts. Bud Shirley was killed in 1864 in Sarcoxie, Missouri, while he and another scout were being fed at the home of a Confederate sympathizer. Union troops surrounded the house and when Bud attempted to escape, he was shot and killed. Myra is rumored to have participated in aiding the Confederate Army in Missouri and to have attempted to avenge her brother Bud's death when her father abruptly sold the farm and resettled the family out of state. After the war the Reed family also moved to Scyene and she married Jim Reed in 1866, when 18 years old. She gave birth to her first child, Rosie Lee (nicknamed Pearl), in 1868. (Although it was rumored that the child was the product of an affair between Myra and Cole Younger, this has been considered romanticized fiction by modern scholars.) Jim turned to crime and was wanted for murder after killing his brother's assassin. He moved his family to California, where their second child, James Edwin (Eddie) was born in 1871. Later returning to Texas, Jim Reed was involved with several criminal gangs. In April 1874, despite a lack of any evidence, a warrant was issued for Reed's wife's arrest for a stage coach robbery by her husband and others. Jim Reed was killed in Paris, Texas, in August of that year by Deputy Sheriff John T. Morris. Allegedly, Belle was briefly married to Bruce Younger in 1878, but this is not substantiated by any evidence. The two were rumored to have cohabited together in Galena, Kansas, however. In 1880 she did marry a Cherokee Indian named Samuel Starr and settled with the Starr family in the Indian Territory. Sam was the son of Tom Starr, a well-known outlaw in the region. Myra changed her name to Belle Starr and renamed Rosie Lee Pearl. In 1883, Belle and Sam were charged with horse theft and tried before "Hanging" Judge Isaac Parker's Federal District Court in Fort Smith, Arkansas. She was found guilty (along with her husband) and served six months at the Detroit House of Corrections in Detroit, Michigan. In 1886, she escaped conviction on another theft charge, and it was during this time she was photographed in a widely publicized picture with "Blue" Duck. On December 17, Sam Starr was involved in a gunfight with Officer Frank West, a Cherokee who had been pursuing him for some time, after a heated argument between the two erupted at a party. Both men were killed. To keep her residence on Indian land, she "married" another Cherokee man. His name was Jim July, Belle renamed him July Starr. In 1889, Belle herself was killed. She was shot from ambush while out riding. There were no witnesses; however, suspects with apparent motive included her new husband and both of her children. A neighbor, Edgar J. Watson  killed in 1910, was tried for her murder, but was acquitted. He had boarded with Belle some time before her death, until she learned of his criminal activities and heatedly dismissed him (perhaps turning him against her in the process). The murder is still considered "unsolved." One source suggests her son may have been her killer  whom she had allegedly beaten for mistreating her horse and for disobeying her. Although an obscure, quiet figure throughout most of her life, Belle's story was picked up by the dime novel and National Police Gazette publisher, Richard K. Fox. Fox made her name famous with his novel Bella Starr, the Bandit Queen, or the Female Jesse James, published in 1889 (the year of her murder). Unfortunately, this novel is still often cited as a historical reference. It was the first of many popular stories that used her name. Belle's son Eddie was convicted of horse theft and receiving stolen property in July 1889. Judge Parker sent him to prison in Columbus, Ohio. Belle's daughter, Rosie Reed, also known as Pearl Starr, became a prostitute to raise funds for his release. She did eventually obtain a presidential pardon in 1893. Ironically, Eddie became a police officer and was killed in the line of duty in December 1896. Making a good living in prostitution, Pearl operated several bordellos in Van Buren and Fort Smith, Arkansas, from the 1890s to World War I.
Gene Tierney played the title role in the 1941 Hollywood film "Belle Starr." Isabel Jewell was Belle in the 1946 movie "Daughter of Belle Starr," and Jane Russell took on the role in 1952's "Montana Belle." None made any pretensions to accuracy. Elizabeth Montgomery was Belle in the 1980 TV movie "Belle Starr." One of the more unique adaptations of the legend of Belle Starr was made by the Japanese mangaka Akihiro Itou - perhaps best known to Western audiences as the creator of Geobreeders - who in 1993 created a manga known as Belle Starr Bandits. Freely inspired by her life and exploits, the two volume series takes liberties with historical figures, facts, and events, and despite its heavily comedic and action-oriented overtones portrays Belle Starr as something of a tragic figure. Initially a young girl who just happens to be a crack shot, as time progresses she is forced to become an outlaw due to misunderstandings and circumstances beyond her control. She eventually develops an inner strength and iron resolve as a result of her experiences. The story takes place in Canada in 1932 and chronicles the efforts of a female author and Belle Starr aficionado to write the definitive work on the female outlaw by uncovering the truth about her life and times. Originally serialized in Fujima Fantasia and later in Dragon Comics, the only known foreign translation was made by the French publisher Pika Edition as part of their Manga Player Collection series in 1997. For unknown reasons, translation work ceased following the release of Volume 1. While still available for purchase online and elsewhere, the series is currently out of print and a release of the second and final volume seems highly unlikely. The Starrs were reportedly related to Bank robber, police killer of a Deputy Marshal  and movie actor Henry "Bearcat" Starr. Contrary to Legend, Belle Starr was not a lover of Cherokee killer Bluford "Blue" Duck, although their picture was taken together. American composer Libby Larsen set Belle Starr's words as the first song, "Bucking Bronco," in her song set Cowboy Songs. The first track on country singer Joni Harms' "Cowgirl Dreams" album is titled "Belle Starr" and tells the story of Belle Starr. Belle may have been influenced along her path in life by patterns she had witnessed as a child. She tends to have followed the lead of her father in opting to marry and cohabit with several men over her lifetime. Also, Belle is known to have taken lovers that reminded her of brother Bud, killed during the Civil War. Sam Starr and Jim Reed were rough characters who were skilled riders and gunslingers. Belle may have been attracted to men whom she thought she could reform, but she did not earn the simple, quiet life she claimed to long for. Throughout her life she ran with men who were frequently at odds with the law, and in the end she was able to control the actions of those around her (including both her lovers and her children, Pearl and Eddie) and seems to have herself turned to the use of force. Belle Starr helped play into the popular image of her as an unfeminine gunslinger by partaking in William "Buffalo Bill" Cody's "Wild West Show" where she showcased her marksmanship and riding abilities. She would become a major figure in the media after numerous love affairs with popular criminals prompted the press to portray her as a daring outlaw and gang leader. During her jail stint in Detroit Belle renamed her daughter Pearl Younger to conceal her identity. Why she chose this name is perplexing and has led to widely circulated rumors that the child was actually fathered by Cole Younger during an early tryst. The press latched onto the issue at a time when fascination with Western outlaws was at a high. The rumor was essentially put to rest when Younger declared, after Belle's death, that he had known the woman, but had never carried on a romantic affair with her. ↑ Glenda Riley, "Belle Starr: Queen of the Bandits," in With Bullets & Badges: Lawmen & Outlaws in the Old West, eds. Richard W. Etulain and Glenda Riley (Golden: Fulcrum Publishing, 1999. ISBN 9781555914332), 140. ↑ The Officer Down Memorial Page, The Officer Down Memorial Page Remembers… Deputy Sheriff Charles H. Nichols, Deputy Sheriff Charles H. Nichols Retrieved October 11, 2007. ↑ The Officer Down Memorial Page, The Officer Down Memorial Page Remembers… Police Officer Frank West, Police Officer Frank West Retrieved October 10, 2007. ↑ Riley, 155. Cohabitation was considered marriage under local Indian custom. ↑ Find A Grave, Edgar J. Watson, Edgar J. Watson. Retrieved October 10, 2007. ↑ Frontier Times, Outlaws - Belle Starr, Belle Starr. Retrieved October 10, 2007. ↑ The Officer Down Memorial Page, The Officer Down Memorial Page Remembers… Deputy Marshal Floyd Wilson Deputy Marshal Floyd Wilson Retrieved October 10, 2007. ↑ Western Outlaw Lawman History Association, Gravesites, Bluford "Blue" Duck Retrieved October 10, 2007. ↑ Riley, 140, 144-45, 147, 148-49, 154-155. Find A Grave. Edgar J. Watson. Edgar J. Watson Retrieved October 10, 2007. Frontier Times. Outlaws - Belle Starr. Belle Starr Retrieved October 10, 2007. The Officer Down Memorial Page. The Officer Down Memorial Page Remembers...Deputy Marshal Floyd Wilson. Deputy Marshal Floyd Wilson Retrieved October 10, 2007. The Officer Down Memorial Page. The Officer Down Memorial Page Remembers… Deputy Sheriff Charles H. Nichols. Deputy Sheriff Charles H. Nichols Retrieved October 11, 2007. The Officer Down Memorial Page. The Officer Down Memorial Page Remembers…Police Officer Frank West. Police Officer Frank West Retrieved October 10, 2007. Western Outlaw Lawman History Association. Gravesites. Bluford "Blue" Duck Retrieved October 10, 2007. This page was last modified on 13 December 2016, at 17:47.